It the 1950s the battle over Elvis Presley was fought out mainly in the press and the pulpit. From their preeminent venues, columnists and clergymen spewed forth their opinions, predominantly negative, of Presley and rock ’n’ roll. The singer’s faithful followers, principally the 14- to 16-year-old female demographic, struck back by flooding the newspapers’ letters-to-the-editor columns with declarations of support. In general the inhabitants of the nation’s institutions of higher learning remained above the fray. College students of the day, generally sporting conservative views and conservative tastes in music, looked down on Elvis. 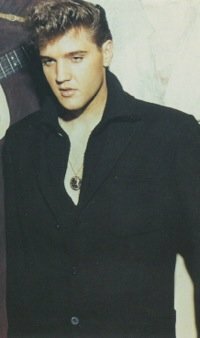 It was a group of Philadelphia college boys, after all, who egged the stage when Presley appeared in their town in 1957. Speaking of eggs, what did the nation’s college professors think of Elvis in the fifties? It’s doubtful Elvis was the subject of much profound academic discussion at the time of his initial rise to fame. The simplicity and nonsensical nature of rock ’n’ roll music and its popular leader were simply not worth serious scholarly consideration. Occasionally, though, the learned thoughts of college professors made their way into the nation’s press. 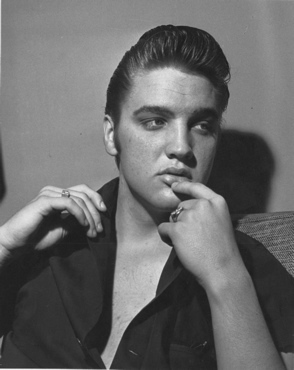 Following are summaries of six published academic analyses of Elvis Presley from 1956 and 1957. The Boston Post didn’t include a first name when detailing on the professor’s opinion of Elvis in its October 2, 1956, issue. The paper reported that Professor Wood had said that Elvis and Praxiteles’ statue of Hermes were look-alikes. The same went for the statue of Theseus on the Parthenon at Athens. Wood declared Presley and the statues had the same nose, same lips, and same sideburns. The professor went further, asserting that Elvis’s bumps and grinds were typical of the twitch and twist of Greek sculpture. 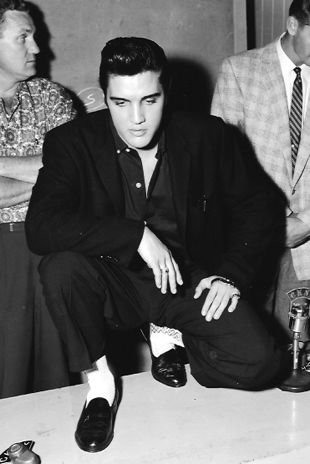 The Toronto Telegram reported that Professor McLuhan came out in support of Elvis Presley during an appearance on CFRB-TV’s “Youth in Action” broadcast of March 31, 1957. “Elvis Presley does a lot of good,” asserted the professor. “He brings millions of people together with a common interest. He is sophisticated, ironical and does his work with tongue in cheek.” The teenaged studio audience cheered his assessment. Professor McLuhan declared that rock ’n’ roll was a definite form of culture, although he discreetly avoided providing details. He also admitted that he had never seen Presley in action. “There’s nothing wrong with rock ’n’ roll music itself,” Professor Jones explained. “It’s the beer hall atmosphere and some of the people associated with rock ’n’ roll that is objectionable.” Variety reported on an interview Jones gave in Austin, Texas, on April 30, 1957. Professor Webster’s homecoming address, entitled “Elvis Presley and Shakespeare,” was the subject of an article in Variety on October 31, 1956. Dr. Webster pompously revealed the secret of Elvis Presley’s appeal to young people. “The music of Presley emphasizes exhaustion, self-torture, frustration and always a rhythm of sullen, ugly complaint," he declared. He contended also that Elvis’s audience was a product of the sudden rise in the birthrate following World War II. “It was the war babies who flocked to see Elvis Presley last night!” Dr. Clark asserted, even though by 1957 the oldest of the “baby boomers” were still in elementary school.